Our secondary containment tanks comply with the US Environmental Protection Agency requirements for capturing leakage from liquid tanks and preventing hazardous materials from escaping to the environment. 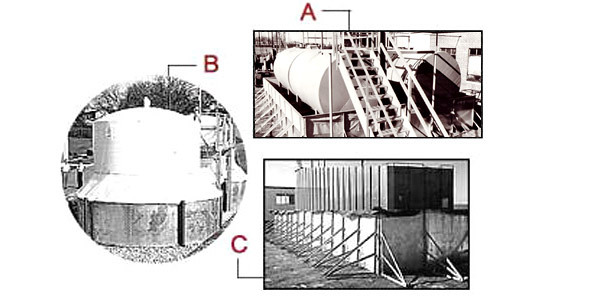 Low-cost secondary containment systems in rectangular or round configurations are designed for erection around existing or new tank installations. All components are galvanized for corrosion resistance and are easily handled for rapid bolt-together assembly using ordinary hand tools. Modular parts can be installed on any firm, level site. Premium quality chemical resistant liners are available to meet industrial and environmental containment requirements. This large metalworking operation sought a means for safeguarding four 5,000 gallon tanks holding hydraulic oils and lubricants from possible leakage. Their solution – a reliable, economical 23’ x 30’ ModuTainer Containment Basin with a chemically resistant, reinforced membrane liner precision fitted to concrete saddles. B. Municipal Sewage Treatment, Plant Valparaiso, IN. Two, 11,000 gallon water treatment chemical tanks are fully protected by 15’ dia. x 8’ high ModuTainer Containment Basins engineered for long, virtually maintenance-free service. The versatile, round dikes, installed four feet below grade, and their durable reinforced membrane liner, offer standby security with dependability and low costs. C. To meet demand of regulatory agencies for secondary containment of Frac tanks, ModuTank Inc. has developed the FracGard for purchase or rental. FracGard capacity starts at 24,000 gallons to hold one standard size Frac tank. Larger FracGards are available. FracGard can be easily and rapidly bolted together from 3’9” x 4’9” H. modular components using ordinary hand tools. Contact us at (800) 245-6964 to learn more!